Show Me Dharma is offering a non-residential retreat, September 14-16. Annie Nugent will be teaching on The Five Spiritual Faculties. Keep reading for more information, or click on the photo to download the flyer. These five “spiritual friends” - confidence, energy, mindfulness, concentration and wisdom are naturally brought to life as we undertake the practice of insight meditation. Working together, they allow for a constancy and staying power to develop in our practice. This retreat will focus on how to balance and strengthen these qualities on our path to awakening, especially in the busyness of our daily lives. Note: payments above base fee of $55 are tax deductible contributions to Show Me Dharma. Scholarships are available—to request a scholarship, please contact the registrar Karen Hodges. 1. 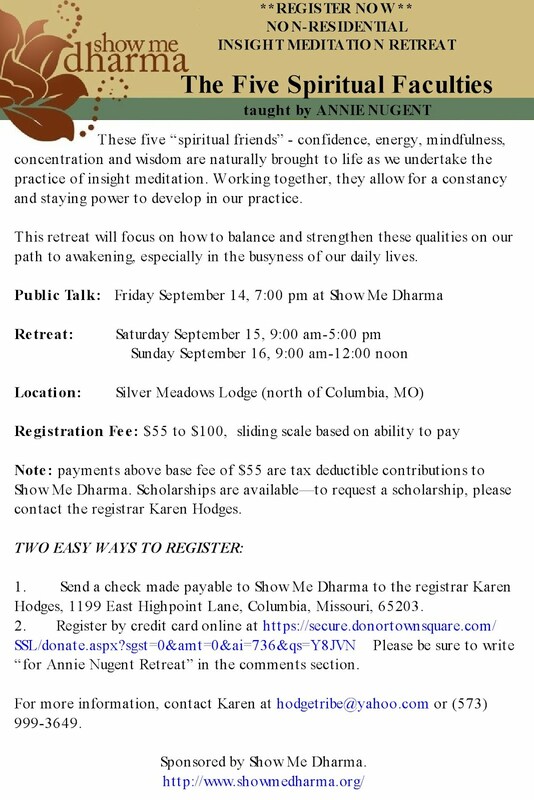 Send a check made payable to Show Me Dharma to the registrar Karen Hodges, 1199 East Highpoint Lane, Columbia, Missouri, 65203. 2. Register by credit card online at https://secure.donortownsquare.com/SSL/donate.aspx?sgst=0&amt=0&ai=736&qs=Y8JVN Please be sure to write “for Annie Nugent Retreat” in the comments section. Sponsored by Show Me Dharma.